INTRODUCTION to This Website: This website will soon have information, materials, and links to documents and articles, that are relevant to efforts to keep a casino from being sited at the location of the old ALCO plant, on Erie Boulevard near Freeman’s Bridge, along the Mohawk River, in Schenectady, New York. 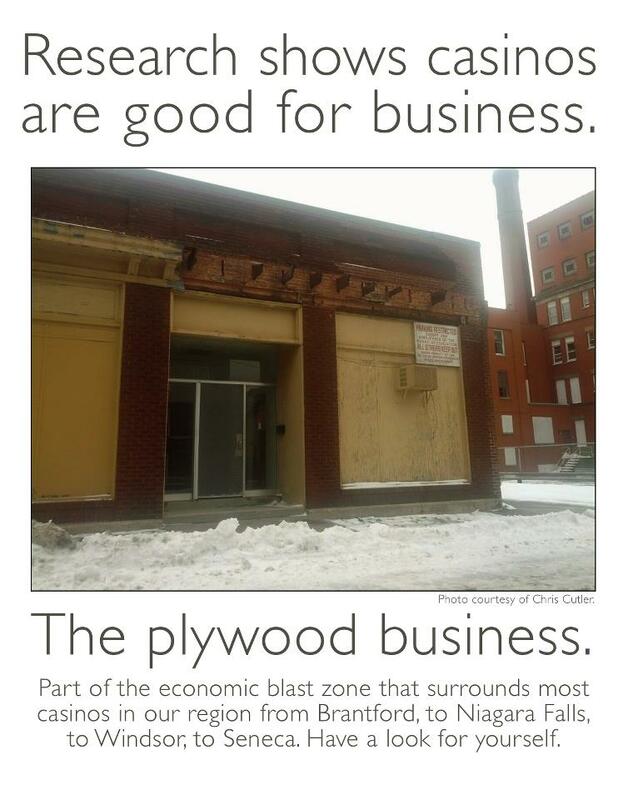 We believe that urban casinos bring more problems than benefits. See Reference Materials below. Urban casinos are risky endeavors, requiring serious analysis. The New York State Gaming Task Force Report to the governor (1996), which favored upstate casinos, said: 1) Stand-alone casinos draw far fewer people from outside the area than a resort-style casino, meaning relatively few overnight stays and a 150-mile market area impacted by nearby casinos; and 2) Most regular casino customers come from within a 25-mile radius, making the casino simply part of the local leisure marketplace (draining dollars from others offering entertainment, dining, sports, and other leisure activities of all kinds). The report also warned of potential crime problems at and near urban casinos, including “prostitution, panhandling, pick-pocketing and purse snatching”; economic crimes by pathological gamblers; and vehicle-related crimes like DUI and automobile break-ins. Such crime is especially worrisome for the nearby Stockade, which was granted historic district protection specifically to preserve its residential characteristics. Street crime and constant drive-through traffic will hurt quality of life in the Stockade, where 55.6 percent of voters said “no” last November to any upstate casinos. update: What About SugarHouse in Philadelphia? A study that came out in July 2014 purported to show that there was no significant increase in crime in the neighborhood of the SugarHouse Casino since its opening in 2010. We think that claim is misleading. See our response in did crime go up near the SugarHouse Casino? . The Applicant for a license to operate the casino in Schenectady is a team consisting of a local construction and development company, the Galesi Group, and an experienced casino developer and manager from Chicago, Rush Street Gaming, which is critiqued negatively here, by a Worcester Citizens Group. Petition: Go to our posting “Petition to Stop the Schenectady Casino” to see the text of our Petition, for a link to a printable version of the Petition, and for instructions on returning Petitions to us this week. Please excuse our haste, but we want to present the Petitions to the Schenectady City Council as soon as possible, as they must vote on a proposed resolution to approve the casino no later than June 30, 2014. Read and download our Flier. Higher social costs for citizens – the bad numbers go up.
. . . logo used in the campaign to stop a proposed Foxwoods Casino in Milford, Mass. At EducateHopkinton.com you will find information used in a successful campaign to defeat a proposed casino in Milford, MA. On Nov. 19, 2013, the casino was voted down by almost a 2 to-1 margin, with 57% of the electorate participating. You have to envy cities and towns with organized, active, well-educated and researched campaigns by residents to stop casinos. Perhaps this is because the electorate gets to vote on a specific proposal, in contrast to our New York siting system, where developer-applicants need to merely woo a handful of politicians, and a few “neighborhood leaders” and businessmen hoping to partner with the resulting casino. Sketchy proposals are then announced to the public, with a very short period available in which to somehow convert the already-convinced local legislative body. For a look at the application and selection process, see the current RFA for Gaming Facilities for choosing among applicants for several upstate New York casino licenses. 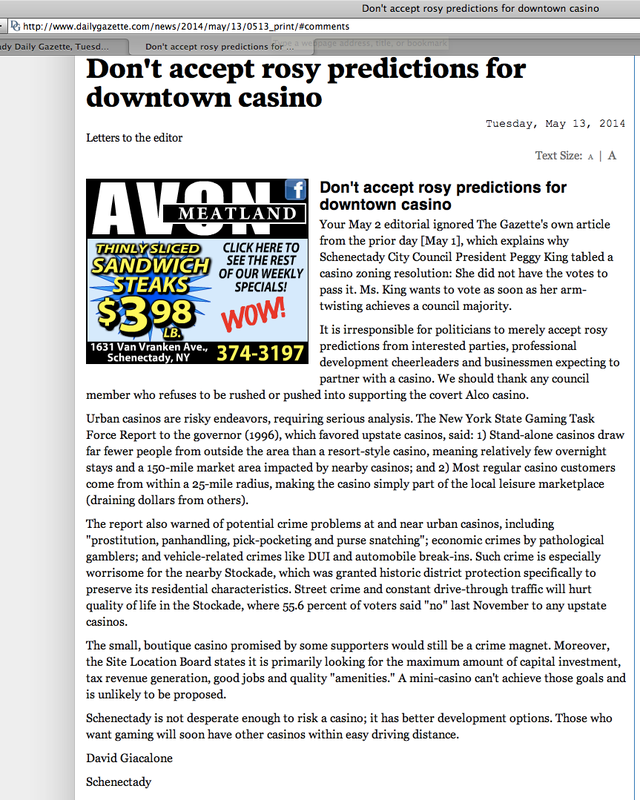 This entry was posted in news & press, punditry/viewpoint, Schenectady Casino, Urban Casinos by David Giacalone. Bookmark the permalink.